Juan Data is everywhere! If one happens to attend a latin event in Oakland or San Francisco, either at a music venue, lounge or bar, chances are that Juan Data is on the turntables. The Argentinean DJ has made a renowned name for himself in the competitive music business in the Bay Area; his mixes and sound are like no other and are recognizable almost immediately. Juan Data is known for playing a vast variety of music from new Latin American artists; that other DJ’s do not use as part of their mixes. 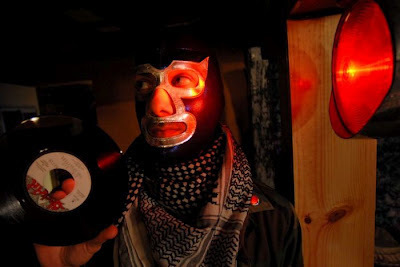 It does not come as a surprise that Juan Data would do the next logical thing there is to do, considering his extensive knowledge in music, to release an EP, and this is how Bondi Blaster was born, and the EP ¡Lo Juimo! was released. This debut EP contains five tracks, and some additional mixes, and the sound of each is truly like no other. It does not matter if one does not know how to dance cumbia or perhaps not even know what cumbia music is, these tracks will make you get up on your feet and dance. The tracks have that infectious cumbia sound, a bit of electronic, some rap and folk. This EP is a delightful and eclectic mix of sounds that are worth adding to your ipod. ¡Lo Juimo! was released on itunes this past March 6th, so head over there to buy a copy of the EP and support Bay Area talent. "Alta Farra" - Bondi Blaster Feat. Gabriel Navia from Bondi Blaster on Vimeo.